The pirr-maw or pick-maw (Chroicocephalus ridibundus) is a smaw gou that breeds in much o Europe an Asie, an aa in coastal eastren Canadae. ↑ Butchart, S.; Symes, A. (2012). 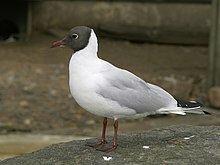 "Larus ridibundus". IUCN Red List of Threatened Species. IUCN. 2012: e.T22694420A38851158. Retrieved 29 April 2016. This page wis last eeditit on 22 Juin 2017, at 01:47.